Cracked heels are a very common problem affecting primarily adults and the elderly. This condition is usually caused by repeat pressure or mild injury to the skin of the sole. 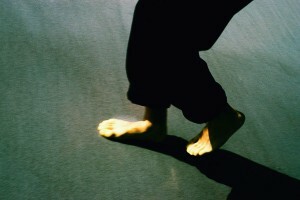 Often a repetitive “trauma” may result from simple, daily exposure to open toe shoes and sandals. Walking barefoot or without socks are the most common causes. The human body skin normally reacts in self defense by thickening itself in areas of repeat injury. Advanced and untreated cases of cracked heel often lead to painful deep cracks or “fissures” in the heel. Cracked heels cause sore, often painful areas with flare of symptoms with increased walking and weight bearing on the feet. Rare advanced and untreated cases of cracked heel can lead to various degrees of redness, swelling, and possible clear or yellow drainage. Frequently, cracked heels can resolve without medical treatment. Complicated cases may require treatment by a physician, most commonly a podiatrist (foot specialist) or a dermatologist. Cracked heel is sometimes the body’s natural defense against repeat foot injury from walking barefoot, walking without sock protection, and applying excess pressure on the heel. The skin gets irritated and as a result gets thicker to protect itself. More rubbing and pressure causes more thickening. After a while, the skin is too thick and tight and cracks under pressure. A vicious cycle may ensue from overaggressive treatment like shaving or scrubbing the thick skin. Rubbing or shaving the cracked heel without properly protecting and moisturizing the fresh skin can often lead to more thickening. This is a very frustrating condition as inappropriate self treatment can actually worsen the cracking. Untreated, cracked heels may cause a break in the skin causing inflammation and possibly infection. The inflammation often causes more thickening of the skin further exacerbating the problem. Are some people more prone to Cracked Heels? Which people are most commonly affected? Older adults who are diabetic and/or overweight are most susceptible. Women tend to be more affected because they wear sandals and shoes without socks. Can cracked heels spread to my hands? This does not usually spread to the hands. Palms may rarely become affected in other medical conditions called keratoderma or psoriasis. What causes infections in Cracked Heels? Bacteria and fungi can easily infect the skin of the feet and nails. The foot is a warm and moist environment and therefore a great breeding ground for many kinds of infections including Staphylococcus, Pseudomonas, Candida, and Trichophyton. It is important to treat any secondary infections resulting from or following Cracked Heels. 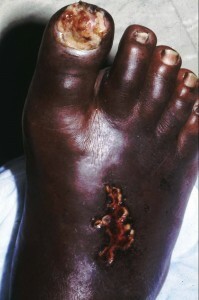 Cracked heels may rarely cause cellulitis (deeper bacterial tissue infection) and very rarely blood infections (sepsis). How do I treat a Cracked Heel at home? It is important to see a physician for Cracked Heels that are very painful, infected, or not getting better after 10-14 days of conservative home treatments. Signs of infection include enlarging areas of redness or a red streak extending from the foot. Signs of cellulitus (tissue infection) include swelling, marked redness, throbbing, and pain. Yellow or green drainage from the wound is also concerning and may require drainage and oral antibiotics. Diabetic patients or any patient with a compromised immune system should immediately see a physician. What kind of doctor treats Cracked Heels? Many types of doctors can help with Cracked Heels. Family physicians, pediatricians, urgent care or walk-in physicians, dermatologists, and podiatrists are among the medical professionals who commonly treat this condition. Podiatrists are doctors who specialize in the diagnosis and treatment of foot and ankle disorders including Cracked Heels. Dermatologists specialize in the treatment of skin, hair, and nail disorders. Mild cases may be treated with conservative measures like warm daily soaks, avoidance of tight or ill fitting shoes, elevating the foot, heel supports; precautionary antibacterial soaks with dilute white vinegar, topical antibiotics like Neosporin, and moisturizing the skin daily. Concurrent fungal infections of the feet (“Athlete’s Foot”) should be treated at the same time with washing with Nizoral shampoo twice a day for 4 weeks and applying Lamisil spray twice a day for 4 weeks. Maintenance can include weekly wash and spray to prevent a recurrence. More advanced cases may be treated with special light treatments using a foot Narrow Band Ultraviolet light box called “NB-UVB” at the dermatologist office. Resistant or recurrent cases of Cracked Heels may require regular in-office care with your physician. It is usually best to avoid aggressive skin removal or injury as often, more injury can lead to more skin thickness. What types of surgery is used for Cracked Heels? Surgery is not suitable for most cases of Cracked Heels. More aggressive, debilitating cases that are infected may require a minor procedure to drain an abscess or open the infection area. Surgery should be considered as last resort after conservative local treatments have failed. Foot and heel surgery may cause permanent scars, painful walking, and other possible complications. Do I have to live with Cracked Heels? No, this is a very treatable condition and should improve quite nicely and relatively quickly with proper home care. Most people who do not change their walking habits and do not use socks may have a prolonged course of cracked heels. If you keep getting a cracked heel, then it may be reasonable to assess your home care and shoe wear to help prevent recurrences. Recurrent Cracked heels may be preventable by wearing heel supports, supportive and cushioned shoes, socks, and avoiding trauma and repeated injury to heels. Further prevention measures include moisturizing your heels, particularly after showers.